Here we are in the early days of February, and my garden is filled with heavenly fragrance. In my temperate Zone 9 garden, there’s still a few leaves hanging on to their deciduous branches for dear life. But with each gentle breeze these dying leaves quickly lose their grip and leave behind one skeletal shrub after another. Thank heavens for the evergreen shrubs in my garden, as they can finally take their turn on stage. And with them brings another layer to the garden – fragrance. My latest book is all about adding layers to the garden, with the focus on color, texture, shape and form. But there’s so many other, less common layers in the garden – fragrance being just one of them. Combining less obvious layers, such as fragrance, with color, texture and form, helps to create a complex tapestry in your garden. It’s these subtle layers that make a person stop in their tracks as they take everything in. It’s these ‘wow’ moments that leave such a lasting impression. A good friend recently gave me this Night Phlox, which is quickly rising to the top of one of my favorites for scent. 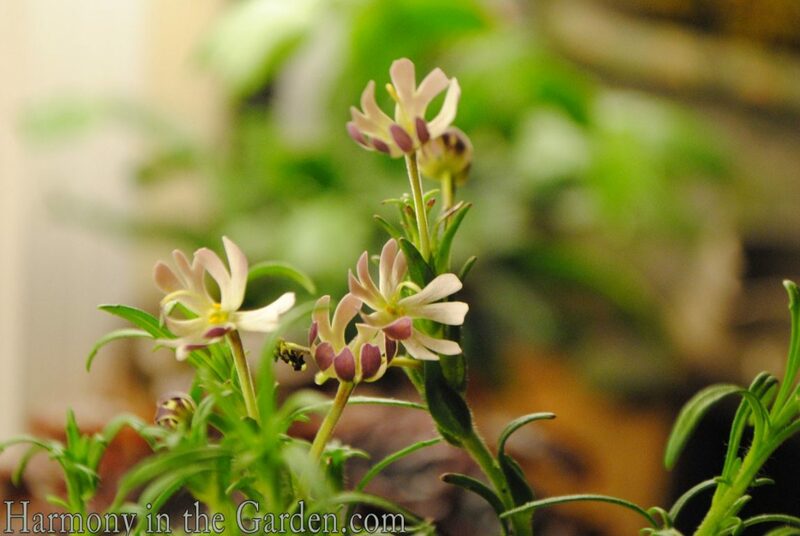 It’s small little perennial, growing to just 12″ x 12″, and according to Annie’s Annuals does best in a container, which is where I’ve planted mine. The really cool thing about this plant is that its maroon buds stay closed during the day, but once the sun drops it opens up to pinwheel-shaped flowers that smell like freshly baked cake. The diminutive flowers of this shrub begin making their appearance right about now, filling the air with their orange blossom-like fragrance. It can be a little finicky in the garden, but after moving mine to three separate locations I finally found the spot where’s it’s happiest – right next to my orange tree. I wonder if it’s the citrus food that makes it happy? 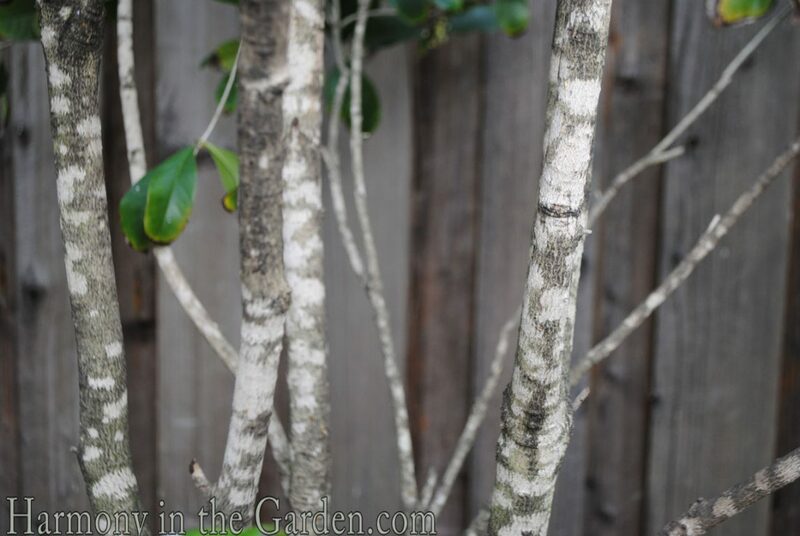 An added bonus of the Sweet Olive is the opportunity to create unusual color echoes resulting from its white and gray mottled bark. Normally growing to a somewhat dense 10′ x 6′ shrub, most people don’t realize it has such beautiful coloring on its stems. But by pruning off the skinny, lower branches you can then appreciate all it has to offer – scent and unusual sources of color! This is one of my all-time favorite, delicious smelling shrubs. It has year-round shiny, small, dark green leaves that sit there and look happy every day of the year. In the shade, no less. I often joke that this plant will grow in a cave, it’s that much of a shade lover. The teeny-tiny flowers begin to make their appearance in late January and come into their own right about now, and while they’re not much to look at, boy do they make up for it with their fragrance! I describe it as a combination of Jasmine and Honeysuckle, with a little bit of magic thrown in. The fragrance always catches people by surprise. In fact, just the other day I was sitting at my front table when I watched a solicitor walk up to my front door to drop off a flyer of some sort. As he turned to walk away, I saw him stop in their tracks and turn back again to walk over to my sarcococca to see what was smelling so good. 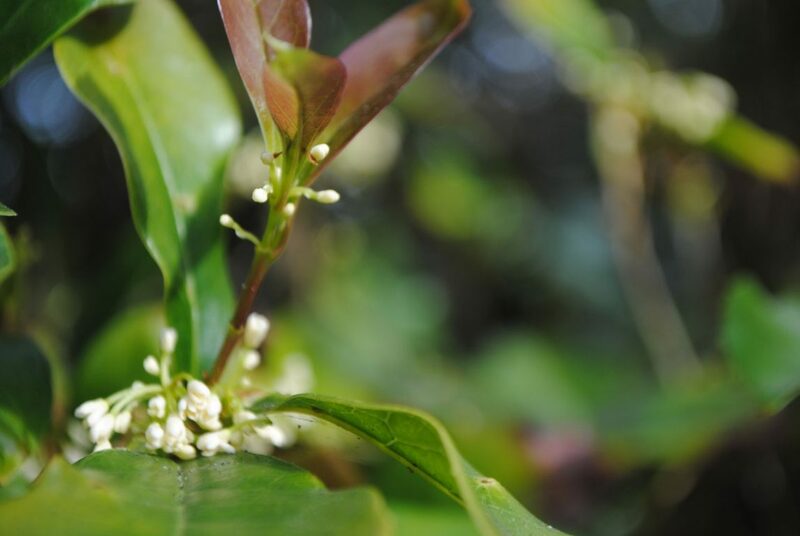 In addition to its winter flowers, the arching branches are also studded with pearl-sized black or red berries. But don’t worry – they’re not horrifically messy berries as the birds usually eat most of them before they drop. And as if its winter scent weren’t enough of a reason to buy this plant, it’s also deer resistant and drought tolerant. 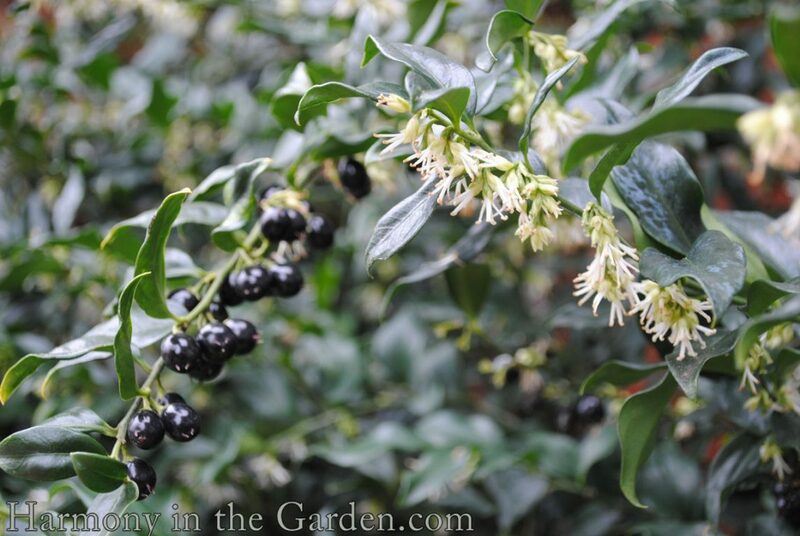 When designing gardens, I always try and plant a sarcococca near a door or front pathway so its winter scent can be best appreciated by all who come and go throughout the day. 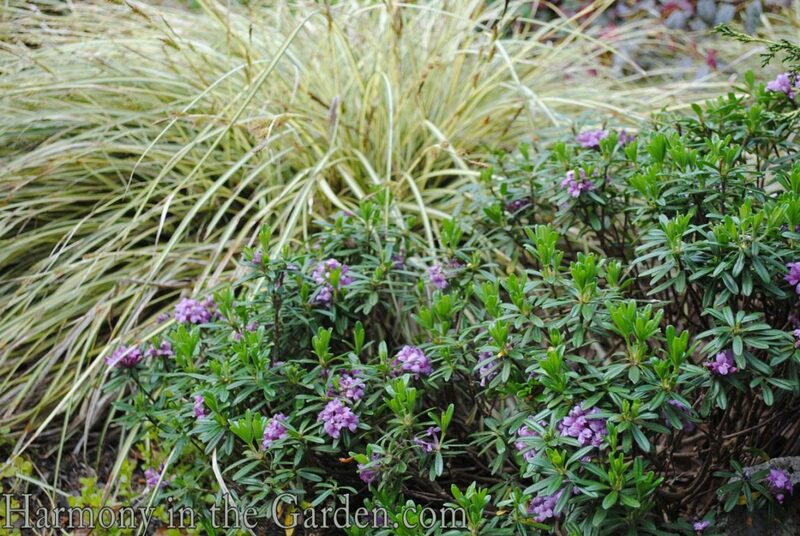 While the sarcococca is busy perfuming one side of my front garden, my daphne is busy taking care of the other half. While I know many gardeners who have given up on temperamental daphne (she hates to be fussed with. Don’t even think of transplanting her fragile roots), I encourage everyone to keep trying until they get it right. Once you find the perfect spot (just a hint of morning sun, with just a hint of water), you’ll be rewarded with the sweetest smelling, rosy pink flowers for weeks at a time. The dog walkers on my street always seem to linger at the front of my garden this time of year, and I know it’s because daphne lures them over with her delicious scent. The ‘Marginata’ variety is one of my favorites, with each green leaf rimmed with a thin line of gold, allowing it to visually ‘pop’ in the shade. And while daphne can be a little pricey (due to her temperamental nature, no doubt) she’s well worth the price. In my opinion, any plant that encourages people to keep the faith – spring is on its way! is worth its weight in gold. There’s been several new heavily variegated varieties to recently the nurseries. ‘Marianni’ has a more compact growth habit, growing to only 3×3 . The leaves have a brighter and more intense gold color that really brightens a shady corner. Just last week I saw another variety called ‘Rebecca’ that I think I need to add to my collection. Another variety I’ve seen is ‘Lawrence Crocker’, but unfortunately I’ve had a hard time finding it for sale in the nurseries. I really like it’s tiny, elongated leaves and the purple-ish flowers (compared to the more traditional pink). 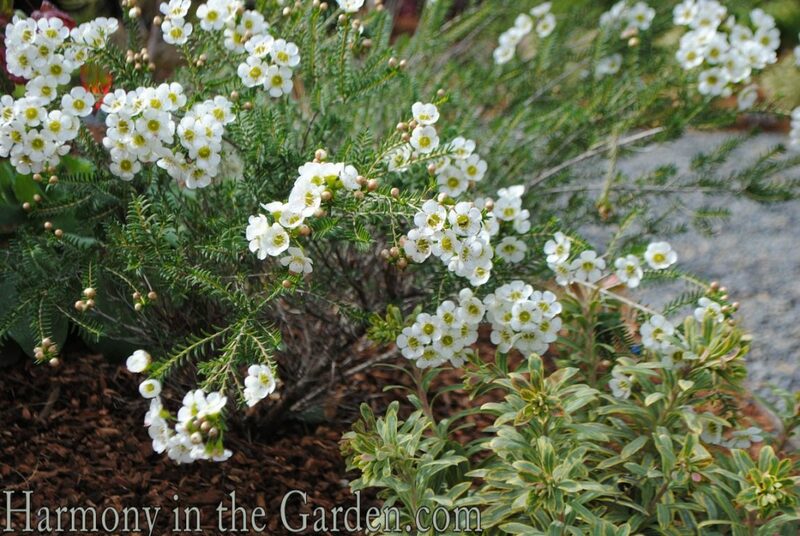 This compact variety of wax flower grows to just 3×3 in the garden. But the real reason I love it so much is its dainty white flowers that have the most delicious scent. ‘Matilda’ flowers off and on throughout the year, but really make a show starting in December. And the chartreuse ‘eye’ of the flower provides another fantastic opportunity to create unusual color echoes. 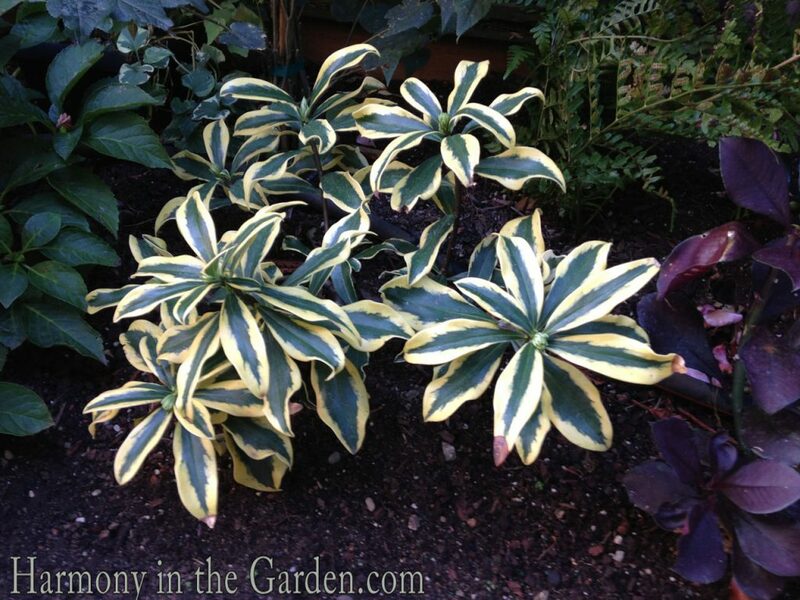 See how I pulled out the color by surrounding it with a similarly colored euphorbia ‘Ascot Rainbow’? Is there a February favorite in your garden? If so, please share – I’d love to know what it is! Cheers to layering–it makes things in the nest feel snugly and warm! As for the garden, beautiful, colorful layering lures you in and then you find it hard to leave. Happy layering! Great suggestions Rebecca. Sure seems like spring is here already in Chico. I’m going to have to look for that night Phlox because it sounds intriguing. I admit that I’ve killed 2 Daphne over the past few years–very temperamental plants but their perfume is wonderful. I know I fussed too much over them! I’m looking forward to the citrus bloom that will be coming. I think orange blossoms are my fragrant fragrance and remind me of the huge groves that used to exist in San Diego as I was growing up. Thanks for sharing! I love fragrant plants as well and right now my Pink Jasmine vine is making all the neighbor’s take a deep breath and smile. I’ve also got a daphne coming into flower and my High Fragrance Camellia is in bud — this will be the first year to smell it but they say it is wonderful. Not scented but this is one of 2 times a year I’ve been getting jeweled blooms on my Bergsmia Nutans. The plant on it’s own is so plain but when it blooms — Oh MY. And for bloom my absolute fave is my Harold Paige, tree-form Camellia. It’s been a non-stop bloomer with vivid pink prolific blooms the size of my hand. And of course the Brugmansia tree never fails to please with is gorgeous yellow trumpets. Well, let’s just be honest, there’s so much going on in the garden right now it’s really hard to pick a favorite. Lemons are on the trees, the blueberry bush is flowering, the violas are running riot. Sigh, I really do love my garden. Spent the whole day out there today working and it was pure bliss!! Hi Joan – wow, your garden is way ahead of mine! My pink jasmine still has its buds tightly closed and my blueberry bush isn’t anywhere close to flowering yet. Lucky you! I have a ‘Scentsation’ camellia which I should’ve included in my post as it has a lovely fragrance – haven’t tried the ‘High Fragrance’ that you’re about to experience. If you haven’t tried it before, pick some flowers and float them in a bowl of water to perfume your room! Heading out in my garden now to see if my pink jasmine might’ve surprised me with a flower or two…. Nothing better than walking by and inhaling a whiff of a sweet fragrant from a plant. We smell one in the night when we walk home from piano lessons every time. (Never before the lesson only after when the sun sets) I have to find out what it is! Interesting! I wonder what that night-blooming sweet smelling plant is. Does it look like the Night Phlox on my post? That also blooms after the sun sets. Very curious what it might be…. I just designed a garden and included a dozen Sarcococca. I hope my client loves them as much as you do! I have no doubt she’ll think of you each winter as she inhales their sweet fragrance! Just discovered your site and am enjoying it immensely. I live about an hour north of Austin, Texas and will soon be moving into my little craftsman home I am building. When finished, I hope people will wonder if this was actually one of the first homes in the area (I’m a vintage buff 😉 I’m always on the lookout for low-maintsinance, deer-resistant plants that will tolerate our hot summers! Loved your pictures of the fireplace mantle in the garden( thank you, Pinterest! ); I have a vintage one in the garage and can’t wait to try it! One question, did you treat yours with anything to help protect it from the weather, or do you accept that in a few years it will decay and need to be replaced? Thanks for your open sharing and encouragement! Hi Kathy, Congratulations on building what will undoubtedly be a charming, charming home! We didn’t treat the old fireplace – it was in such poor shape to begin with, so I figured it’ll need to be replaced at some point. If it was in really great shape I probably would have, though. I’d love to see what you end up doing with yours!! 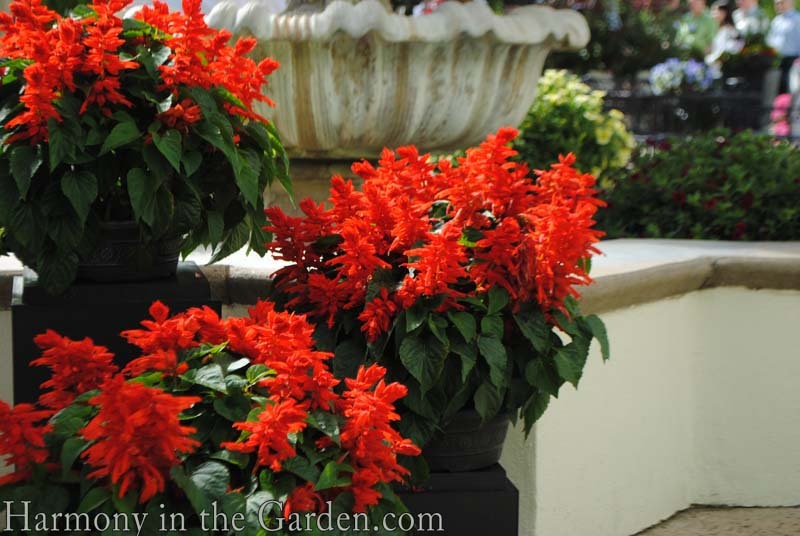 A February garden favorite? Perhaps the Dwarf Alberta Spruce which adds a bit of interest to the forlorn February New England landscape. Or, it could be the begonias which are in the indoor garden. One must find treasures where one can. Can’t wait to see you, Dee! Hello Rebecca,I live in Arizona, and now i have full blooming my favorite emu- bush,/ now it is gold emy/ , it was started blooming 1 month ago and it will blooming all next month, my valentain – emy started blooming also, but it is still very small bush with very delicated flowers. I fall in love with emu- bushes since 2007 and since that I am looking for new variety of them every time when I go to Boyson Thompson Arboretum, AZ,they have the best collection of emu in Arizona. Thanks Yelena, I hadn’t heard of the Emu bush but after looking it up I see it’s a really beautiful (and tough!) shrub. Thanks for telling me about this (new to me) plant! My February favorite is Edgeworthia chrysantha (here is a good picture: http://www.gardensandplants.com/uk/plant.aspx?plant_id=1178). Edgeworthia is deciduous where I live (U.S. zone 6) and has sculpural blooms hanging down in little dusty white bells that open into clusters of yellow super-scented flowers. Heavenly on a rare warm February day. 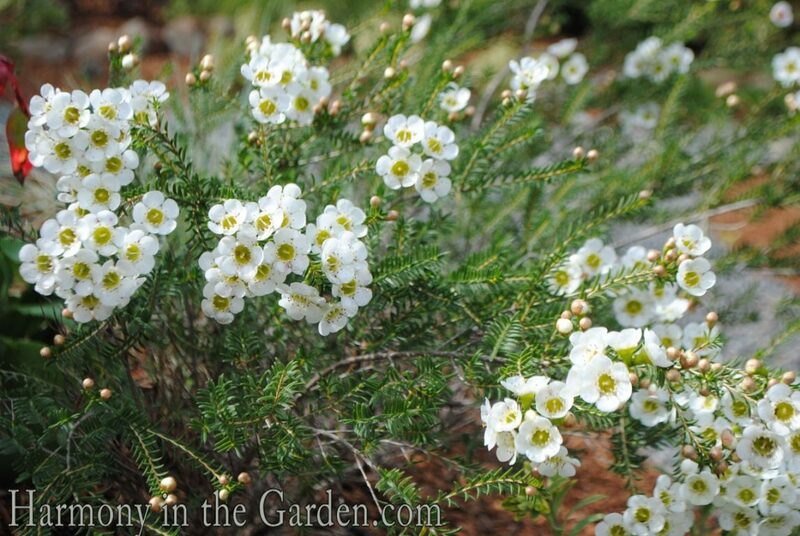 I am SO glad to find out about this shrub – it looks absolutely charming!! Thanks for the heads-up, Karen! I am in zone 8 and have planted Sarcococca at the back door and on the side of the house. Both spots are just finishing flowering. It is heavenly. The Daphne’s will start shortly. It is hard to have favorites in the garden, but they would be close. Loved the photos, thank you for sharing. My new sarcococcas are blooming! And growing…even during the winter. Amazing. I am taking a centerpiece to my daughter’s house today for a Super Bowl party tomorrow where there will be lots of sweaty male type people cheering on the 49ers. I think I’ll add some sarcococca–can’t hurt, right? My Daphne is just starting to stop us in our tracks in the backyard. My favorite winter blooming plant is my magnolia…starting to bloom now, silly thing. Three years ago a friend gave me some Sarcococca stems she had rooted so I planted them in my garden. This is the second winter and they look great and now blooming. You are right about them growing in a cave, here in Marin I run into a huge planting under redwoods and they looked great. In fact I took some cuttings that are about to root and will plant them in other areas. I find though that they grow really slowly, is that right? Daphne is another plant I love, but don’t have in my garden until now. However I am concerned that the spot where I was thinking of planting it is too wet. I might have to reconsider. A plant that is doing great in my garden is euphorbia, they are all forming the inflorescence now, love the colors. No smell though. And my succulents, oh my! The winter for some meant great growth, they look amazing now. I am obsessed with them! I wish I had a nursery that carried more near my town. 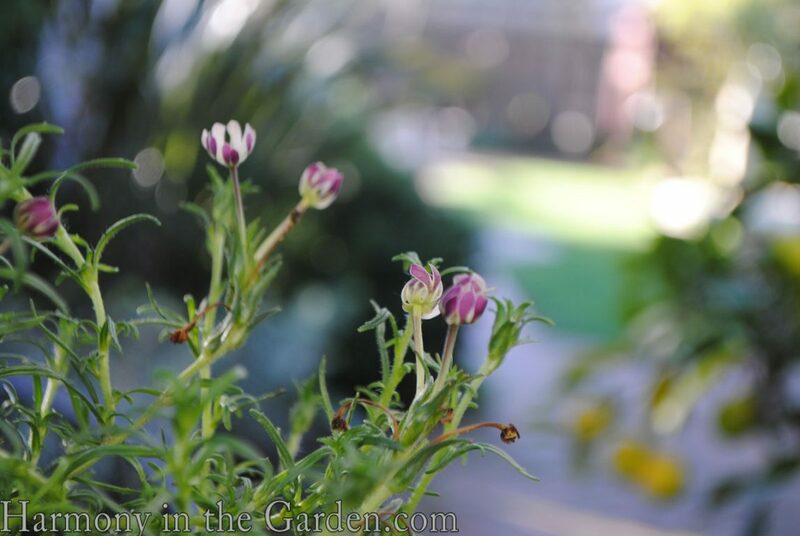 As far as I am concerned, spring is already here, I can see weekly changes in the garden, everything is awakening. Love living in California for this reason, winter is really short. Third year is the charm, you are right! It looks like the plant is taking off now. I like your suggestion of keeping the Daphne in a pot. Happy Spring to you, too, Laura! p.s. If you ever want to treat yourself, you should take a field trip to Succulent Gardens in Watsonville. It’s a bit of a drive, but you would find yourself in succulent heaven. Row and row and row of fantastic succulents, filled with fellow succulent lovers such as yourself! You’ve reminded me how much I loved the Sarcococca I had at my old house. I’m going to have to hunt it down to try at my “new” (2 year-old) house. Although I’m just 15 miles south of my former location, the summers here are as much as 10 degrees hotter but, maybe, if I tuck it into deeper shade, it’ll survive. This February, in my current location in California’s South Bay area, my favorite bloomer is Echium handiense ‘Pride of Fuerteventura’ with its bright blue flowers. Oh yes, Kris,you should definitely find a new spot for one in your new house! Echiums are so beautiful, aren’t they? Have you ever seen the ones blooming all throughout Golden Gate Park? They’ve established impressive colonies there (as you drive through it on 19th) and I often wonder how many fender benders they’ve caused when in full bloom….